Wappoo Creek Bridge is on Folly Road and connects James Island to West Ashley. 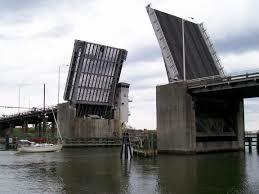 It is a double drawbridge which means that two spans will open simultaneously. It was built in 1956 and is part of the Atlantic Intracoastal Waterway system. The bridge is an “On Demand” bridge, that is, it will only open if a boater calls in and requests it. Even though boaters can call in, the bridge will only open at specific times. The changes were made to alleviate traffic backup during rush hour. To read the complete text from the Coast Guard, click here.